We all text (maybe more than we should). In fact, for millennials, texting is the most frequent form of communication. On top of that, a recent survey revealed it’s how they like to be communicated with during the hiring process too. The report, which surveyed over 1,400 young adults between the ages of 18 and 30, shows that 86% of respondents felt positively when text messages were used during the interview period—an increase from 79% in 2016. For recruiters, this means that texting should be added to your arsenal of ways to communicate with candidates. Not only do many of them like it, but for you it’s quick, easy, and typically gets a fast response. However, as appealing as it is, some candidates might still consider texting to be unwelcome and at times invasive. This post will walk you through some texting etiquette—the do’s and don'ts that every recruiter should keep in mind in order to provide a great candidate experience. Texts are harder to ignore than calls, voicemails, and emails. And, that can be a double-edged sword when communicating with candidates. An unsolicited text message might not seem super work-appropriate for everyone: for some, it can be invasive. Also, a text message can create a sense of obligation or urgency. For a candidate you’re wooing, the last thing you want to do is come across as pushy or presumptuous—that can make them quickly lose interest. What You Should Do: Before the interview process starts, ask candidates how they would like to be communicated with. Specifically, are they ok with updates and other info via text. You could even include a form in your job applications allowing candidates to select their prefered communication method. 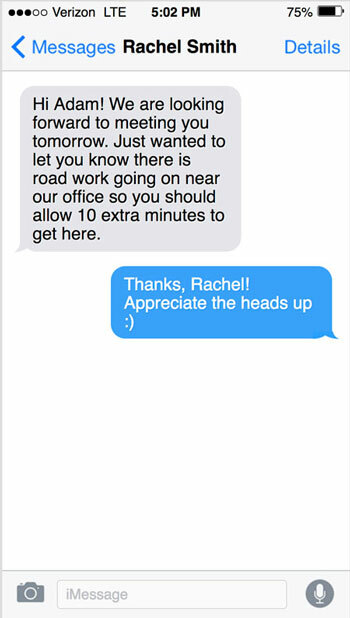 If they say yes to texting, keep your messages meticulously professional, and send them during reasonable hours (read on). 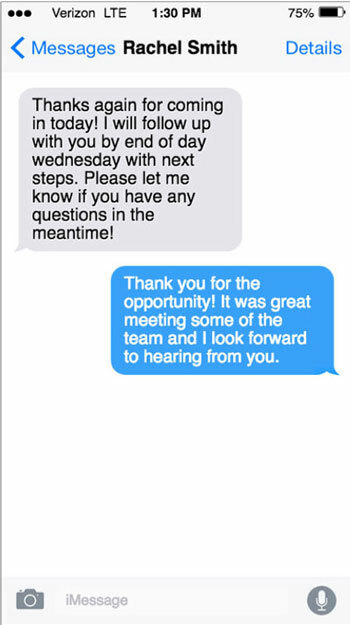 For candidates that are open to it, texting is a great way to trade logistical details. You can confirm an interview time, answer a quick question about directions, acknowledge your receipt of something, and even send a warm thank you after an interview. And since most people are never far from their phones, you can assume the candidate will see your text. Using text to do anything else creates problems: it leaves things open to miscommunication and more lengthy communication is best done via email, on the phone, or in person. What You Should Do: Don’t text an essay. Be short, sweet and to-the-point with your messages, and ask questions that your text-friendly candidates can answer without having to strain their thumbs. You might even tell them that you’ll probably use the medium mostly to discuss logistics. That way, you set their expectations—and assure them you won’t abuse the privilege. It goes without saying, but texting isn’t appropriate for the more delicate stages of the process. It’s much better to communicate some things—like a job offer or rejection note—over the phone or via email. A majority of respondents said that the morning, between 8am and 12pm, was the best time to send a text related to the job hunt. 12% of respondents were most put off by texts unrelated to the job hunt. What You Should Do: Don’t be too casual. Remember that your candidates are striving to present themselves as professional and responsible, and your professional courtesy will help them feel secure. Also, keep your texting to reasonable hours, from an hour before the start of the workday until an hour or two after it ends. 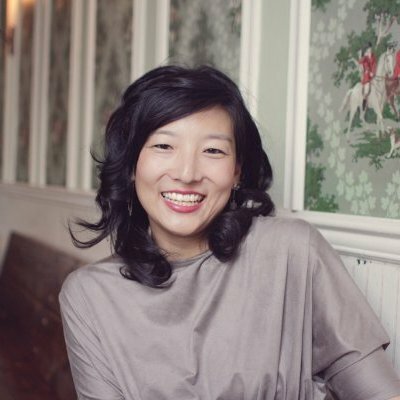 This way, you’re putting your employer brand in the best possible light. There are a number of tools that can help you manage your text messages with candidates. These could come in especially handy for reaching out to a high volume of candidates, or monitoring and logging conversations. TextUs is a texting platform than can be integrated into your CRM workflow. TextRecruit uses a customizable chatbot built with AI to initiate conversations and pre-screen candidates. And Canvas is a text-based interviewing platform with transcription, customizable interview questions, and markup functions. What You Should Do: Not every tool will be right for everyone. Think about the volume of texts you send and test out some different tools. Recruiting pro Stacy Zapar keeps her candidates organized by using a hashtag (e.g., #candidate) in the notes section or in their name in your phone. Then every month or so, she can search by that hashtag and delete all the entries that are not longer active in order to not have dozens of former candidates cluttering her contacts. For candidates who are open to it, texting is a great way to keep them in the loop and improve their candidate experience. It can keep you on the same page, deal efficiently with follow-ups or logistics, and help them feel more engaged. But the medium isn’t right for everything. It’s important to stick to clear rules of communication, efficiency, and professionalism.